Old Man Emu suspension components are perfect for those who want ride quality over 'show' quality. You may find taller or more heavily advertised suspension lifts on the market, but you will never find anything that ride more comfortably, has greater load capacity, or is more durable than Old Man Emu. If you truly are looking for the 'best' suspension and not just the most popular or one that temporarily sits an inch taller (most lifts sag quickly, not OME), then you have found the very best suspension on the planet for your Rover. Nissan at left pictured and with the ARB Bull Bar which we also carry at unbeatable prices. Click the image for a larger view. Old Man Emu lifts are listed below. Some folks might ask why OME suspensions are not available in taller lifts? OME's philosophy is quality and sensibility without complications. OME sizes their lifts such that there are no problems or modifications required to steering, braking, or drivetrain. Any taller and these items do become an issue. For most people, the extra inch or so isn't worth all the headache and cost necessary. Do it right the first time with OME! 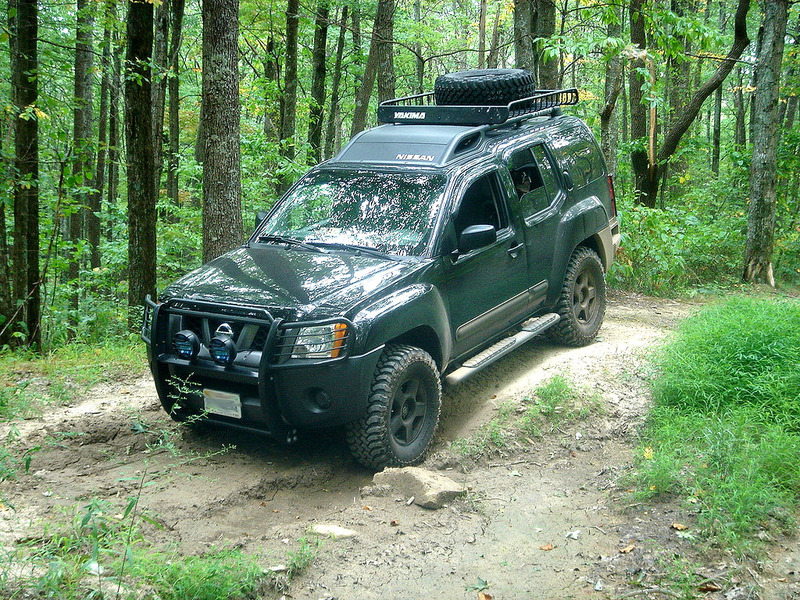 Old Man Emu lifted Xterra sporting BFG 265/75 r16's. Rocky Road will always be committed to bringing you the best products and service. Find out why we are a leader in ARB sales throughout the world and 3rd largest on the planet for Old Man Emu volume. Contact us with your best deal, and we'll try and beat it so you can be confident in dealing with a premier ARB facility! Please call or email us for questions regarding international, Alaska, or Hawaii shipping. Assembled Nissan Xterra Lift Struts! All Nissans use a front strut system. Sometimes assembling these struts can be challenging to impossible for folks who want a simple Do-It-Yourself home installation. Rocky Road has the solution! Our kits now come with the option of pre-assembly which makes it so anyone can install the Old Man Emu lift on their own without special equipment. Our preassembled struts come with the new bushings and new Nissan strut mount. If you find a lower price on Old Man Emu components, we won't just meet it...we'll beat it! 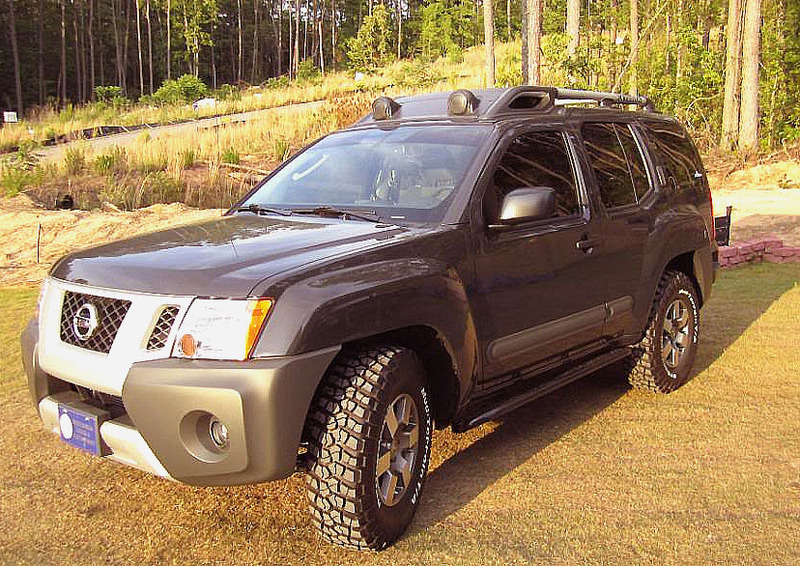 Click on the links below to find more information on our excellent high quality parts from ARB for your Nissan Xterra. ARB and Old Man emu equipped Xterra. Shown sporting 265/75 r17 tires. Click picture for larger view! Does your vehicle's rear end sag when you hook on your boat, trailer or van? 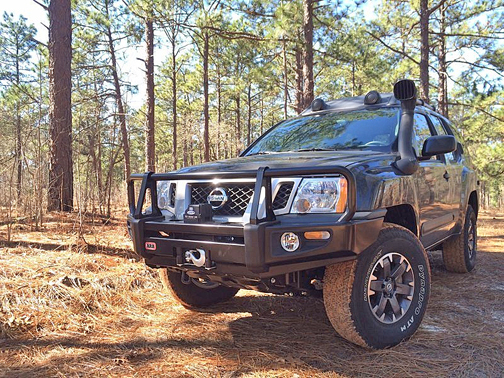 Do you need more ground clearance off road? Is your on road ride bouncy, harsh or uncomfortable? 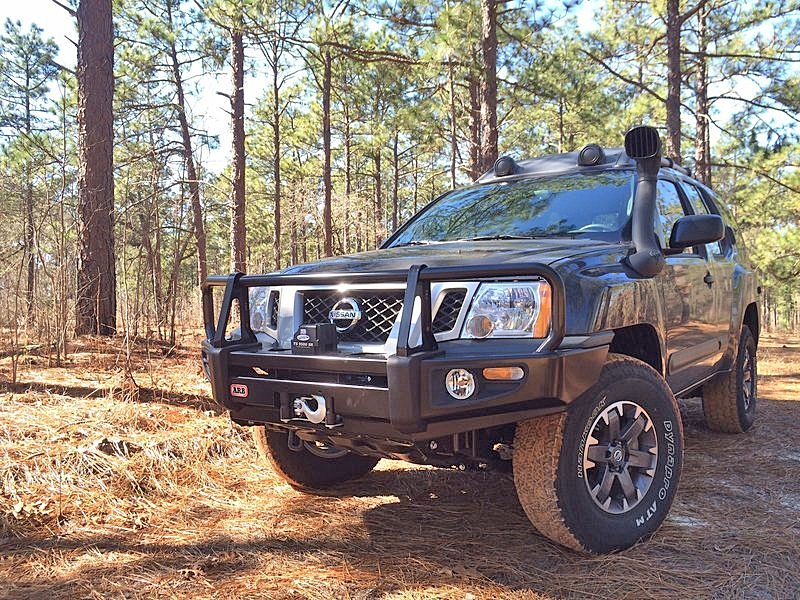 Has the addition of a winch reduced your front end ride height? Does your vehicle pitch or buck crossing rail tracks or uneven bitumen? Have you ever lost traction off road? Does your vehicle sag when it's loaded up with work tools? 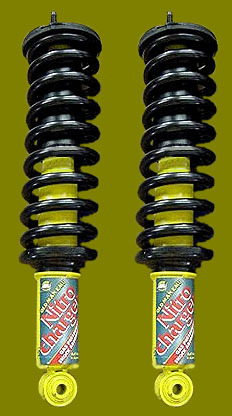 Do your shocks need replacing? Is your on road handling & control vague and unresponsive? Can your vehicle cope with all the gear required for a long trip? Are you concerned about the sway or body roll your vehicle exhibits when cornering? 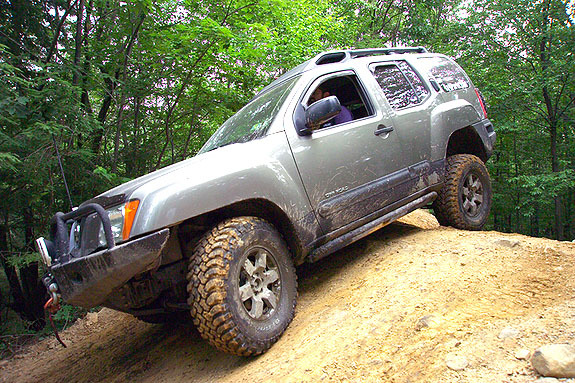 Does your vehicle get hung up on uneven, off road surfaces? Old Man Emu 4x4 Shock Absorbers & Suspension Systems. Along with the kangaroo the emu makes up the Australian coat of arms. Because of their sheer mass emus can't fly, but have you ever seen an emu run? The massive strength in their legs allows them to move over all types of terrain with the greatest of ease, yet their bodies remain virtually motionless, their legs taking the majority of the terrain's impact. This is what Old Man Emu strives to achieve with its range of fully integrated 4x4 shocks & suspension systems. Vehicle suspension, especially that fitted to 4WDs, is complex to say the least. So many factors go towards determining the right solution, and no one "fix" is the answer to all vehicle models. Old Man Emu is unique. The philosophies, technology & methods behind the development of each of our products combine to ensure you get the best components the world has to offer. From humble beginnings in the tough world of off road racing in Australia, to now being respected world wide, OME takes a unique approach to the design, development, testing and support of our product range. 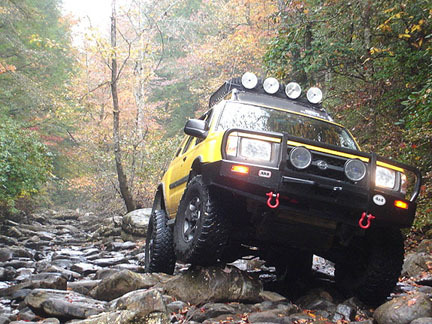 Many of our customers love toughing it off road, and this can vary from endless hours, even days, of flat, yet corrugated dirt roads to serious, deeply rutted, rock strewn off road tracks. At the other end of the spectrum there are the four wheel drive owners who have no intention of tackling anything remotely off road. Instead, they're looking for dramatically increased ride comfort on the bitumen or to give them access to their weekend property or their favorite, out of the way fishing spot. Old Man Emu caters to the entire spectrum of customer & vehicle requirements. Full load or empty, the critical factor that determines the correct suspension solution for your vehicle is weight. The amount of weight carried varies from vehicles with few accessories and which are only used for day to day commuting, to the other extreme of fully set up vehicles for work, touring or towing carrying a full fuel load, water, food, camping equipment and tools. Mining companies, too, fall into the extreme category & whose working environments can destroy OE (Original Equipment) springs in a matter of weeks. Complete integration of our components is what sets Old Man Emu apart from the rest. OME is not just a collection of parts sourced from a variety of plants around the world. Whilst we scour the world for the best suspension technology, we offer a tuned and matched, integrated set of suspension components that are designed by ARB and manufactured in Australia, with an unrelenting, no compromise approach. Shock absorbers & springs for each new vehicle start off as prototypes, and are tested and modified in a variety of terrains and with varying loads. These trials and modifications can take weeks of testing in order to ensure the best possible combination for each application. We test & modify, test & modify and continue to do so for as long as it takes to ensure each shock & spring combination is totally at one with the vehicle, its varying weights & the varying terrains it's to encounter. This results in a range of shocks to suit standard OE springs and a further range of complete OME shock absorber and spring packages. There are kits for light, medium or heavy loads, kits that won't increase ride height and kits that give maximum lift. There are systems for heavily weighted rears but no load up front and systems that are made to handle the exact opposite. There are kits for petrol models, kits for diesels & kits for vehicles with LPG. And within each kit each component is designed and developed to work in complete harmony with other matching components. Rocky Road Outfitters can supply the right combination of components to cater to your needs with a result you wouldn't think possible. I know this group (ARB) goes on and on and on about their suspension but I was a touch sceptical - why do I need to spend extra on a suspension for a $30,000 plus vehicle? But all the bucks was money well spent. If we knew the difference this (OME) upgrade would make to the truck we'd have driven it straight from the dealer to OME. Click the pic for larger view. This comment, taken from a chat forum, from an excited Old Man Emu customer is typical of the benefits enjoyed by customers of Old Man Emu all around the world. Superb, on road, ride comfort. Increased levels of ride height to suit individual requirements. Substantially improved ground clearance for excellent off road traction. Elimination of rear end sag - for those owners who tow or carry a lot of weight. Only OME can offer all these benefits by providing the only, fully integrated suspension system for your four wheel drive. You will appreciate the work we do every time you drive your vehicle. You will love the way the vehicle eats up the bumps, and steers around corners. You will marvel at how the wheels stay in touch with rock strewn and rutted tracks that you winched up the last time. You will relax when you pull out of the driveway with the boat, trailer or van behind you. Every other challenge you throw at your new suspension will remind you of how well we do our work.